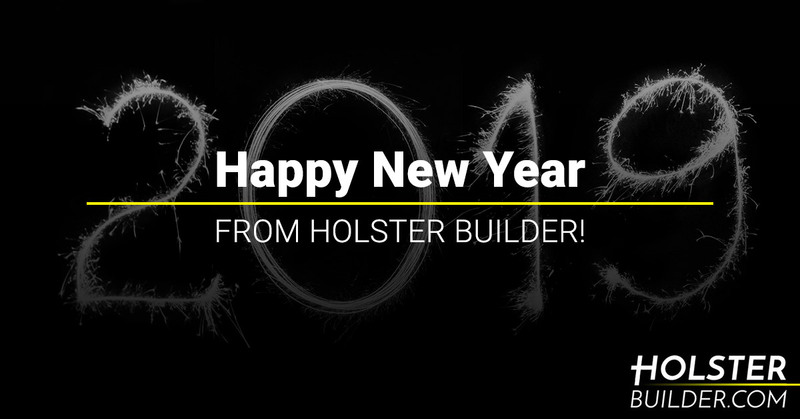 Happy New Year From Holster Builder! The scope of New Year’s resolutions kind of runs the gamut. For some, the goal is to eat healthier and lose some weight. For others, they’re dead set on spending more quality time with their family. Other still are dedicated to pursuing their hobbies and learning about them as much as possible. There’s even a group of people who want to start making their own holsters. Although we can’t help you with the first couple of resolutions, we have you covered on that last one! Whether your goal is to make a few holsters for friends and family or you are itching to start your own holster making business, we have all of the holster making supplies you need! There are a lot of statistics floating around out there about how many resolutions fail and how quickly people give them up. Here’s the deal — you’re the one who determines your goals, and you’re the one who can achieve success. The problem is that most of the time people set their goals unattainably high. It’s no wonder that people give up so quickly. At Holster Builder, we want to set you up for success. That’s why if your goal is to dig into the art of holster making, we’d be honored to help by offering everything you need to get started off on the right foot. Finding kydex for sale can be a challenge. The same is true of belt attachments, buffing supplies, and finishing washers. The good news is that we have them all. See if this story sounds familiar. We were shooters first. Then we became interested in finding the best holster to suit our preferences. When we realized how tough that was, we decided it would be worth the effort to start making our own. We’re sure you can identify. Whether you’re completely new to holster making or you’ve been trying your hand at it for awhile, our goal is to be a go-to resource for you at every step of the way. There’s nothing in the world more satisfying than making things. Thankfully, the art of making is once again on the rise. Trades that were once considered to be going out of style have found their resurgence as people all across the world seek to learn more about how to make things for themselves. From backpacks to planter boxes to clothing, people are starting to take responsibility once more. We live in a day and age where it’s easy to buy pretty much anything and have it arrive at your doorstep in a few days. Unfortunately, it also means that we’re not really that self-sufficient anymore for the most part. The point is that you can build pretty much anything when you put your mind to it, and that’s an attitude that we think should be encouraged. That’s what we’re here for. Whether your goal is to sell holsters for a living, make them for yourself, or just to make something period, we’re all for it and we’d love to do what we can to help you out along the way. Order Your Holster Making Supplies Today! We’re committed to supplying the holster builders out there with anything they need to succeed by having low prices, great customer service, and always-affordable shipping anywhere in the United States. Take a look around to shop for everything you need to form and create your custom holsters, and be sure to stay tuned for more great content! Have a question? Hit us up on Facebook! By Holster Builder|2019-02-11T09:45:31-05:00January 2nd, 2019|Holster Making Supplies|Comments Off on Happy New Year From Holster Builder!